cycling weekly carries a regular feature each week depicting one of britain's wide range of cycling clubs. so far they have resisted the temptation to cross the water on a cancelled ferry to catch velo club d'ardbeg as we meander aimlessly around the estates, but on the basis that we're far more average than these pixels would have you believe, that is of no great loss to the cycling community. however, to return to the clubs that have been seen in the pages of the comic i find myself quite mystified as to the uniformity of their apparel. it is probably written on page one of the british cycling book of do-it-yourself club constitutions, that many a long hour ought to be dedicated round the conference table arguing over firstly, the design of the club jersey and secondly, who ought to be charged with providing same. when at college, the guitarist in the band of which i was a founding member always carried a notebook in which he would scribble possible names for beat groups, all the better to lessen the period of silence when time came to choose one to paint on the bass drum head. it's always possible that there are like-minded individuals in the velocipedinal world who are perennially scribbling sketches pertaining to jersey design for precisely the same purpose. if that is truly the case, on the basis of one or two seen in the comic, they should have been either encouraged to scribble a while longer, or quit altogether and let someone else take over the task. but if we accept that club jersey design is a highly emotional and subjective subject that ought to be relegated to the conference table mentioned above, what about the 'never mind the quality, feel the width' aspect of life? for, without wishing to diss the majority of those keen to offer the use of their dye-sublimation facilities, very few of the world's team jerseys, shorts, jackets or even casquettes inhabit the area best known as cutting edge. this is not to infer that it really ought to be, but if climate change is as true as they say, the day of reckoning might not to be too far distant. basically what i am taking the usual roundabout way of saying is that when folks such as rapha, santini, endura, castelli et al spend more than just a few research and development pound notes on continually pushing the state of the art. on the basis of cycling weekly's regular feature, why are so many willing to suffer the iniquities of fabric ordinariness? there are jerseys and jackets on the market today that are all but impervious to kryptonite, yet alf and norm from the cycle club are still quite content to pooter about in bog-standard, slightly ill-fitting polyester, apparently oblivious to the availability of cycling's force fields. one gent who must surely be wondering the same thing for most of his working week is simon carr, principal fellow at maratona cyclewear. having very recently perambulated my hebridean retreat clad in their excellent spring classics jersey, i thought i'd find out a bit more on our behalf. 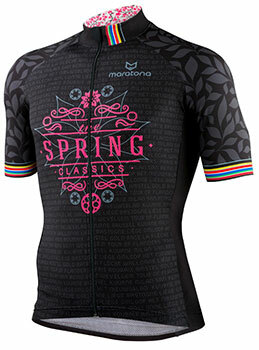 maratona is a new one on me and when it comes to cycle clothing, i (and others) consider me to be a bit of a know-it-all. so how long have they been in existence? 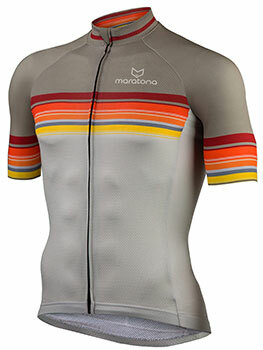 "Officially, the shop door opened at the end of September last year, so Maratona is very much in its infancy. As our current stock is all spring/summer wear, we are looking at the '17 season as our first. The original plan was to launch Maratona earlier in '16, but the behind-the-scenes work to set up the right supply chain, design and approve samples, photography, website build etc. was quite extensive and took far longer than anticipated." if i might take you back a few paragraphs to where i made mention of the guitarist and his book of names, i doubt that it is any easier to arrive at a suitable name for a clothing company than it is for a beat combo. bear in mind that it is rarely the sort of thing about which you can change your mind just as the business enters its third year and you realise it might be the name that's holding you back. and there are other considerations too. i am far too much of a prude to go any further than to simply point out at one time a race car sponsored by cona coffee had to have the decals blacked out when racing in portugal because the word has a somewhat rude connotation in the iberian peninsula. no doubt hours of enlightened chatter took place at maratona headquarters, but for the record, from whence did the name arrive? "Good question! We went through many names. All didn't survive the overnight test and ended up in the bin. A close riding buddy visits the Maratona Dies Dolomites every year and every year he has asked me to join him. My work as a photographer has stopped me so far, but the yearly discussion about this road trip set the seed for the name Maratona. Aside from the translation to marathon, we also wanted to reflect the Italian aspect; it's where we source our performance fabrics from. It just felt and sounded right." having mentioned his work as a photographer that leads me to the question as to simon carr's involvement in the cycle clothing business. the majority of my photographer acquaintances and friends are people who rely a great deal on their sense of design, even those who deny they have any in the first place. i'm thinking of individualists such as ben ingham, emily maye, camille mcmillan, scott mitchell, daniel pasley and others. contrary to the widely held belief that, in these days of intelligent auto settings on the majority of digital cameras, anyone can be a photographer, the above mentioned provide quite definitive evidence to the contrary. in which case, what is simon's background with relevance to his having created maratona cycle clothing? "I studied at art college and became a graphic designer, working for a major London advertising agency, ultimately progressing to my becoming a senior art director. I worked on automotive accounts and directed photographic shoots for Ford, Mazda and Jaguar. These sent me to many locations around the world, often away for three weeks at a time and being responsible for creative content of the images and managing a sizeable location team: Photographer, production, lighting and rigging crew, models (that bit was tough), vehicle transport etc. "My passion has always been photography. I learned a lot from the commercial guys that I was hiring and in the end, took that step a little closer to the camera and became a professional photographer myself. So my background is mostly visual and creative based." referring to my quizzical opening paragraphs and why so many club members would opt to wear team kit as opposed to the more formidable commercial offerings, you cannot have failed to take note of even the minimal number of apparel purveyors mentioned at the time. though i've said it before, i bear no embarrassment in mentioning yet again my contention that cycling must surely be the most overcrowded of apparel markets in the world. unless, of course, you count the endless variations on the pringle jumper worn by golfers. assuming simon doesn't disagree with my contention, why on earth would he subject himself and maratona to the vicissitudes of such fierce competition? "I think it was the culmination of a number of things. A personal frustration, as I felt some of the smaller brands that produced unique and original looking kit had taken their eye off the quality ball, opting for cheap oriental production and fabrics for their designs. 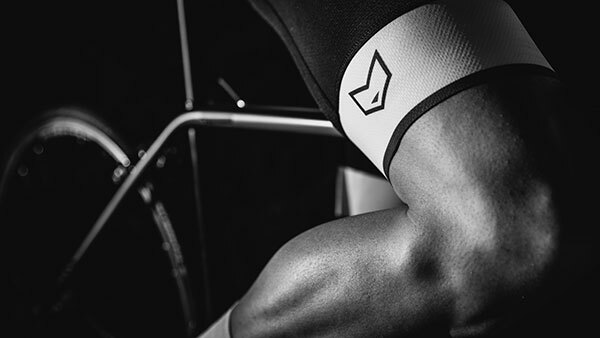 "I felt that there was a clear space for a cycle clothing company that valued performance and fit as much as creative originality delivered at a fair price. That's pretty much where Maratona sits as a mission statement. "Over the past couple of years I have also become involved in some club kit design that either went down very well, or was deemed to be pushing the boundaries slightly too far. 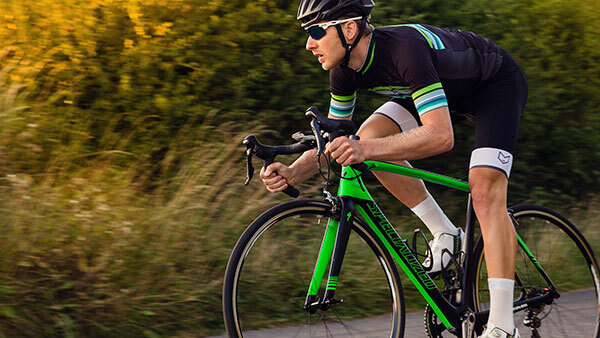 "The UK cycling apparel market is looking busy. But, as cycling popularity continues to blossom, we feel that quality and originality will continue to be desirable." many of you will be less than surprised that i am, once more, about to make use of a percussive metaphor, but it's one that i think quite relevant. in north america there exists a company by the name of keller who will supply wooden drumshells to individuals and companies keen to make their own drums. of course, in the majority of cases this consists simply of engineering the bearing edges, providing a stain or covering for the outside and attaching appropriate hardware. ultimately, with a shiny metal badge on the outside, the finished drum(s) could be sold as the latest marque on the block. perhaps you'd need to be a drummer to comprehend the disappointment on discovering what you took to be a fine vintage drum was no more than the badged produce of someone else's efforts. on becoming involved in the cycle industry all those years ago, i was naively of the misapprehension that each and every apparel provider had a roomful of seamstresses confined to a backroom and grew their own lycra in the company allotment. at the risk of busting another myth, does maratona have its own manufacturing facility? "No. Maratona is just too small at the moment to consider that, although, in the grand scheme of things it's very much our thinking. "Finding the right people to partner Maratona took some considerable effort. We found a great European manufacturer who supplies national teams, the pro-peloton and had many road and velodrome winners at Rio wearing kit produced by them. They're very much driven by similar thinking to our own - technology and cycle garment performance - so the relationship is working well." in my daily work, also as a graphic designer, i have been recently charged with producing a contemporary style menu for a new restaurateur. initially the finished product will be printed in a small quantity until such time as things settle down and the new proprietor comes to terms with that which sells and that which doesn't. when that point is reached, the menu will likely be printed in bulk to take advantage of pricing. the same scenario presumably applies to recently constituted cycle clothing companies. there would be little commercial prospect in offering a wide ranging lookbook featuring all manner of cycling kit only to find nobody wanted to buy it. 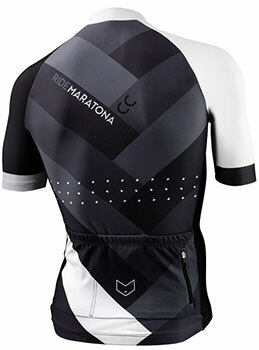 thankfully, maratona cycle wear has been well received, but would it be safe to assume that simon plans to introduce jackets, bibtights, overshoes, caps etc in the future? "Yes. The response to Maratona so far has been extremely promising. We have just added two new short sleeve jerseys (illustrated here) to the mens '17 range, including the first in our Elements wind/rainproof fabric, plus another pair of men's bibs. There is a new ladies bib short due soon. Baselayers from plain branded to uber funky will be along soon. We are also working with a UK sock manufacturer to develop a very high quality summer sock; these are currently being tested by our Essex-based friends who ride for pro teams. All of the kit has been out in Lanzarote this year at pro training camps. These guys kindly give us some valuable feedback and the reassurance that we maintain our brand mission statement. "At the end of summer '17 we will release a range of autumn winter wear. 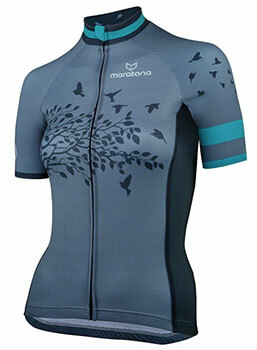 Long sleeve jerseys, jackets, 3/4 pants, bibtights etc." a cycle clothing range can become like the proverbial piece of string. start with jerseys and shorts, add socks, tights, baselayers, jackets, collars, caps, gloves, gilets... the list is endless. and that's only for the chaps and chapesses who like to go fast on skinny wheels and bendy bars. but what about the folks who regularly commute at a more sedate pace? "We are very much focused on 'race' wear and do not want to dillute that offering. There are a few dedicated leisure/commute based cycle clothing companies that cater for this market very well. "At some point we will offer some branded casual gear; Tees, caps, hoodies etc." were it not for the tacit arrangement that members of the velo club meet at around 10am outside debbie's on a sunday morning, there probably wouldn't be any club at all. we'd be a disparate bunch of misfits riding around on our own, all dressed up with nowhere to go. the ten o'clock thing is, in essence, our cunning plan. coffee aside, is this something that maratona has in a filing cabinet drawer? "At the moment we are just seeing where the journey takes us. Having fun with the brand is key. As long as it remains fun we'll keep pushing and hopefully growing."